I inform you that the following sentence was dictated in a formal notice from a Scout Canada attorney during the 1907-2007 World Scout Centennial. "The Internet site that you will be visiting is not sponsored, supported, nor financed by the Canadian Scouts Association". Unfortunately, Scout Canada chose to create prejudice against me. So, for those interested in knowing more about this setback story, you may read about it under "Mr. Guy D'Aoust". As a born pathfinder, I want to present you this charitable project in order to create a better world for the young scouts. While reading it, you will notice my usual outspokennness. I wish to let my light shine to guide you and show you the positive aspect of this project. As my father used to say, there is nothing wrong with telling the truth. The staight path is the shortest. It is my pleasure to invite you to read this marvelous project on which I have been working, against all odds, with my wife, Yvette since 2007 year of the World Scouting Centennial. This economic, touristic and humanitarian project is a Christian work related to the virtue of charity and is completely transparent. It has required a great deal of intellectual work and a huge sum of money that is not visible to the average person, except for those who steal ideas (those who are guilty of plagiarism). It is sad to note that within the movement there are some undesirable people who do not respect their pledges or the scout laws. Therefore, it is up to you to discover the three concepts and aspects of this wonderful project and contribute to its success in order to leave this world in a better shape then when you came because this is the desire of God, Baden-Powell and I.
I am happy to invite you to the Baden-Powell Scout Palace. However, I must inform you that this palace is unlimited and accessible to the whole world. Former scouts/guides have been inducted in various categories, depending on the grade achieved at the time of their involvement. According to this concept, there is also room for the current scouts and guides who really want to make progress in this movement so that one day they may receive their Baden-Powell Scout Palace certificate, in the diamond category. Dear boy and girl scouts, one day somewhere on this planet, the Scout founder said “Once a Scout, always a Scout”. According to information gathered on various Internet sites, the scout flag floats in 216 countries and there are currently 40 million scouts listed in the world. There are 100 million persons alive today who have participated in this extraordinary movement. During the centennial, there were 300 million scouts in the world, of which 17 million were in Canada. This makes us a very big family having had the pleasure and honor of being educated according to the philosophy of scout founder General Robert Stephen Smith Baden-Powell. He was born on February 22, 1857 in London’s Paddington district and died on January 8, 1941, at the age of 84. His body is resting at the foot of Mount Kenya, in the town of Nyeri, East Africa, waiting for Judgment Day. According to the information gathered on the Internet regarding Baden-Powell, it is my opinion that he was a peacemaker, therefore a son of God. “Blessed are the peacemakers, for they shall be called children of God.” Matthew 5:9 (Shem tob version of the New Testament). One has to assume that there are also sons of the devil on this planet and they are warriors. However, many don’t know that Baden-Powell was an Anglican Protestant Christian. Read the book "The Great Controversy" written by Ellen G. White. Baden-Powell was given the title Lord of Gilwell by King George V in 1929 at the third World Jamboree in Birkenhead (United Kingdom). In my opinion, Baden-Powell has been the greatest social educator of young people in the 20th century. That is why it is so important for the boy and girl scout movement to have its own Virtual Scout Palace in honor of the founder of the greatest youth movement in the world; a movement based on divine principles as well as on the love of one’s neighbor and respect for nature. That is the reason why a proposition letter was sent to Her Majesty on December 10, 2012, regarding a request for recognition to be sent to the global organization of the United Nations to honor and recognize the founders of World Scouting: Lord Stephenson Smyth Baden-Powell, and his wife Olave Baden-Powell, founder of Guiding and first Chief Guide of the World, as the forming couple for the 20th century's social youth, which you may find in the menu/third letter to the Queen. I am asking for your co-operation in helping me develop a great worldwide scout fraternity through this wonderful site www.scoutpalace-BP.org , which gives you the opportunity of becoming a member of this fraternity. With today’s technology, it is easier for us to get to know each other on a global scale. In order to be inducted into the BP Scout Palace (BPSP), all you have to do is write a short autobiography and, if possible, translate it into the language of your choice; it is a way of introducing yourself and summarizing your participation in the movement by presenting a few anecdotes. Just imagine the thrill of recognizing, through this virtual Palace, people that you have once met at a jamboree or other activities from different corners of the planet. 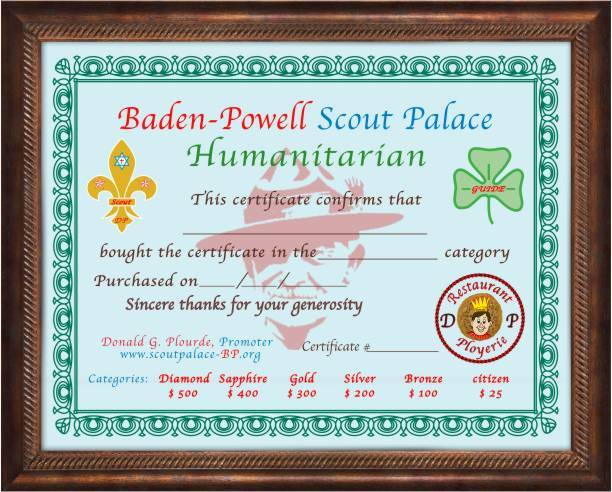 The profit of the Baden-Powell Virtual Palace Induction Certificate and the Humanitarian category Citizen are shared as follow: $15 to BP Oasis scout sector or other youth groups and $10 to Scout Palace Inc. In addition, for the BP Oasis scouts and guides or others, there are some royalties on the six scrolls at the BP store. 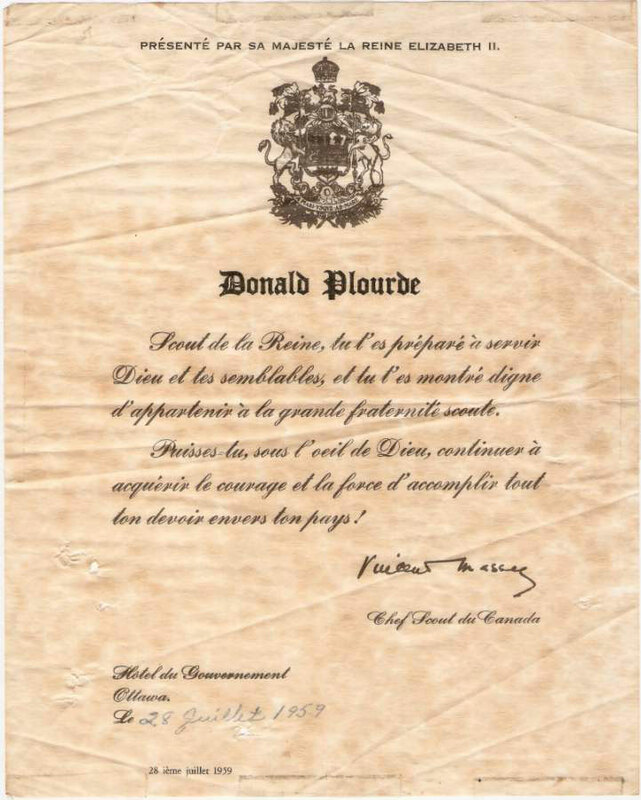 The profits for the other four BP Scout Palace certificates are shared as follow: 25% to the French-speaking Canadian scouts and guides, 25% to the English-speaking, and 20% will be given to other group who work toward a better development of the Canadian youth, 20% to World Vision and 10% to Scout Palace Inc., a non-profit corporation. In witness whereof, I certify before God that this information is true. The Humanitarian certificate includes the first five categories written on the certificate, namely: diamond $500, sapphire $400, gold $300, silver $200, and bronze $100. The size is 16 X 13" laminated and framed. It will be sent by various transportation means. The Citizen category costs $25 and will be sent by email, but if you want it framed it will be shipped to you at a cost of $50. 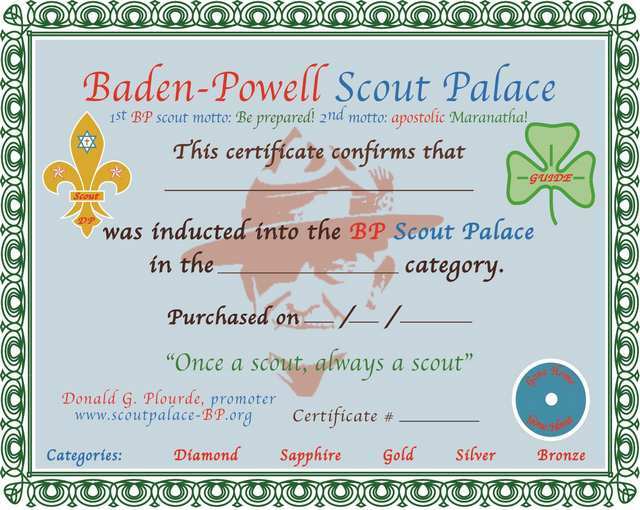 As mentioned above, the profits will be shared as explained above in the BP Scout Palace Induction certificate. 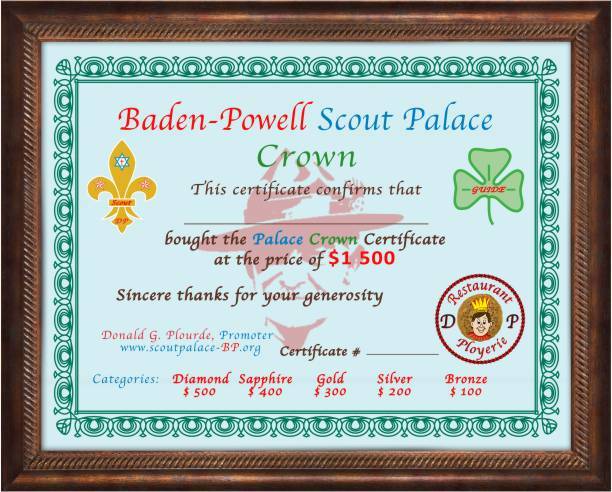 The 16 X 13" Palace Crown certificate is laminated and framed and sells for $1,500. It has been added for those who wish to give more towards the development of our youth. 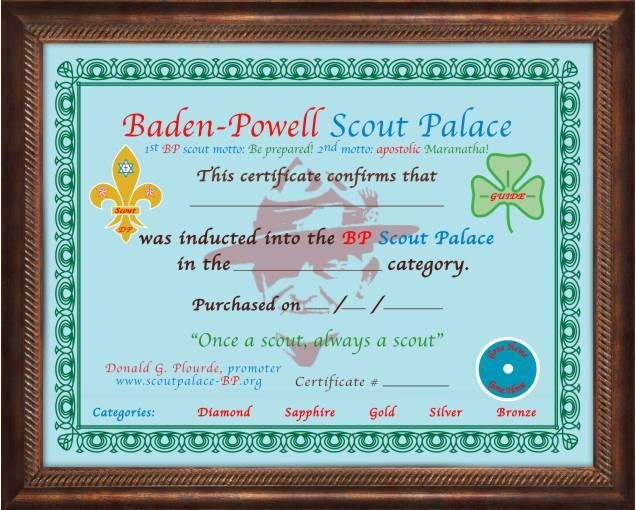 This certificate includes all five categories of the BP Scout Palace Induction certificate. As mentioned above, the profits will be shared as explained above in the BP Scout Palace Induction certificate. 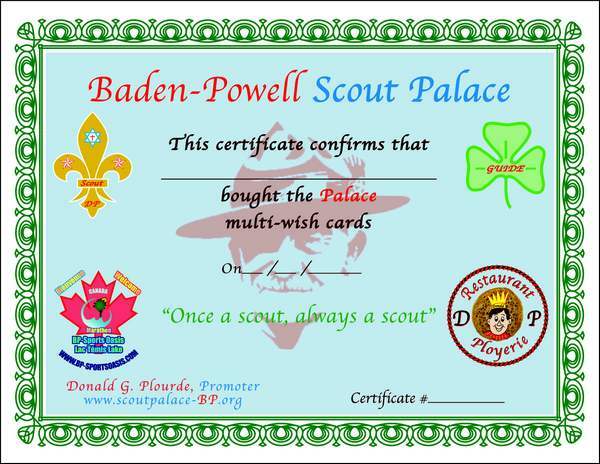 By purchasing the multi wish card certificate at $25, you will receive 20 greeting cards commemorating Robert Baden-Powell, the founder of the scout movement, Olave Baden-Powell, the first world chief girl guide, Her Majesty Queen Elizabeth II, as well as the Royal Couple from Baden-Powell Scout Palace. These cards may be used for various occasions, as well as giving a certificate as a gift to friends. The profits will be shared as specified in the Induction Certificate. Therefore, anyone who is interested in seeing the 4 multi wish cards, the 3 stickers (Baden-Powell, Olave Baden-Powel as well as Her Majesty Elizabeth II), as well as the two 3 x 3.5 inch embroidered badges (Baden-Powell and Olave Baden-Powell), click on them in the Store/multi wish catalogue. The sticker is $5 and the embroidered badge is $10. The profits will be shared as specified in the Induction Certificate. You are invited to visit the catalogue via BP Oasis Palace in order to see the sharing of the royalties for all the BP Oasis Palace certificates to be given to the Oasis scout sector and among various humanitarian organizations on the Oasis territory. 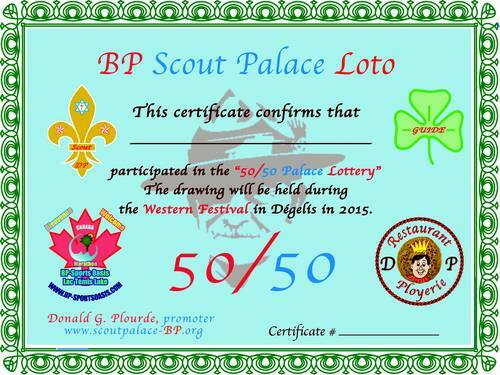 The BP 50/50 Scout Palace Lotto certificate costs $25 and is shared as follow: 50% to the winner of the BP 50/50 Lotto, 20% to Scout Palace Inc., a non-profit corporation. The remaining 30% will be shared among some French-speaking and English-speaking scout sectors in Canada. The first draw of the Lotto 50/50 BP will take place at the Dégelis Western Festival in 2016. Subsequently, it will be done annually during a festival around the beautiful Témiscouata Lake. Abraham Odyssey is the preamble to the biography of the Baden Powell Scout Palace Certificate. Being a staunch scout (pathfinder), I invite you to read Abraham' Odyssey written for people who are seeking the truth regarding the parousia (the glorious return of our Lord Jesus). First of all, the pale blue background recalls heaven, infinity, and God’s universe. The blue letters of “Virtual Palace” represent water while the red letters of “Baden-Powell” stand for the sun and all its warmth. The brown letters represent the earth and the green of the frame reminds us of our forest ecosystems, which provide us with the air on our beautiful planet that was once the Garden of Eden. We, therefore, find life’s four essential elements: earth, water, air and sun. 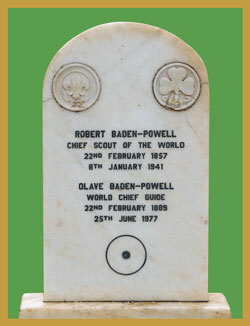 The certificate’s two symbols, the fleur-de-lys and the cloverleaf as well as the trail sign are found on the tombstone of the founder, Robert Baden-Powell. The fleur-de-lys, which is the symbol of the scout movement, is adorned with two five-point stars evoking God’s as well as the scout movement’s Ten Commandments. The Star of David is the symbol of Judaism from which Christianity arose. The Golgotha Cross, in red, reminds us about the bloody sacrifice of the Lamb of God immolated for the forgiveness of our sins. It is also the symbol of the Hebrew Nation, God’s chosen, the descendants of Abraham, Isaac, and Jacob, who became Israel. He said to him, "What is your name?" He said, "Jacob." He said, "Your name will no longer be called Jacob, but Israel; for you have fought with God and with men, and have prevailed." Genesis 32:28, 29 (OC). As a consequence of all the ensuing consequences, about seven hundred years after the exodus of the Israeli people from Egypt, the awaited Messiah issued from the line of David was prophesied by prophet Balaam in Balak, king of Moab. “I see him, but not now; I behold him, but not near; A star shall come forth from Jacob, A scepter shall rise from Israel, And shall crush through the forehead of Moab, And tear down all the sons of Sheth.” Numbers 24:17 (OC). Therefore, it must not be kept secret that around seven hundred years AD, the Islamic religion dared to appropriate this prophecy for its own personal purposes. According to history, the Islamic religion started when Prophet Mohammed was supposedly visited by an apparition of Angel Gabriel. Seven hundred years before, inspired by the Holy Spirit, Paul the Apostle warned us in 2 Corinthians 11:13, 14, “For such men are false apostles, deceitful workers, masquerading as Christ's apostles. And no wonder, for even Satan masquerades as an angel of light.” Consequently, we will one day witness the victory of truth over untruthfulness. Furthermore, history tells us that the Islamic religion arises from the descendants of Ishmael, son of Abraham, so they are not God’s chosen since they are from the lineage of Israel. However, God in His infinite love sent His Son Jesus as Messiah to save all of mankind, so each and every human being must convert to the one and only Messiah, Jesus Christ. “And, behold, thou shall conceive in thy womb, and bring forth a son, and shall call his name JESUS. He shall be great, and shall be called the Son of the Highest. And the Lord God shall give unto him the throne of his father David.” Luke 1:31:32 (NC). “For God so loved the world that he gave his one and only Son, so that whoever believes in him shall not perish but have eternal life.” John 3:16 (NC). The clover-leaf is the symbol for the girl guides, a movement that stemmed from the Boy Scouts movement. The three petals represent the three moral virtues of scouting, namely, honesty: always being ready to tell the truth; dedication: always being ready to do a good deed for one’s fellow man; purity: always being ready to stay morally pure in order to be pleasing to God. The circle with the dot in the center is a Baden-Powell trail sign meaning “I have gone home”, which in this case means the Garden of Eden restored with the coming of the Lord Jesus. The first scout motto, expressed by Baden-Powell “Be prepared!” means always being ready to listen to the voice of your conscience since it is through that voice that God talks to us. The second apostolic motto, “Maranatha”, is an Aramaic word, the only one in the Bible that has never been translated. “If any man doesn't love the Lord Jesus Christ, let him be accursed. Maranatha! The Lord is coming! The grace of the Lord Jesus Christ be with you.” 1Corinthians16:22,23 (NC). This word means: The Lord is coming. So, nobody can ignore that there is only one Lord, namely the one who, one day, shed His blood for the forgiveness of the sins of the world on the cross of Golgotha, outside the walls of Jerusalem, which means city of peace and is considered as the center of the universe (navel). “Thus says the Lord GOD: This is Jerusalem. I have set her in the center of the nations, with countries all around her.” Ezekiel 5:5. Fortunately for us all, a few days after his resurrection, after giving his instructions to his twelve apostles, He ascended to the sky from the garden of olive trees and told us that He would be coming back at the end of times to save His chosen people before Judgment Day. “I, Jesus, have sent My angel to give witness to you of these things in the churches. I am the root and the offspring of David, the bright and morning star. Revelation 22:16 (NC). I hope this biography will enlighten you on your path of life and will guide you towards the marriage supper of the Lamb. “And the angel said to me, Write, Blessed are they which are bidden to the marriage supper of the Lamb. And he said to me, These are true words of God.” Revelation19:9 (NC). Fortunately for us, this is what the story of the prophecy tells us. God is truthful, so we will soon see the victory of God over the fallen angel, the father of untruthfulness, the enemy of our souls. Happy day for me on this 2nd day of February 2013 at 3:33 p.m. while I was reading page 750 of my Petit Larousse 2000 dictionary, I had the chance of finding the word Parousie (Parousia) which is, in my opinion, the most important word imagined by man to explain a happy event for humanity the meaning of which is: Glorious return of Christ at the end of times for the Judgement Day. So, any person who is interested in learning more, just read all the paragraphs where the biblical verses have been extracted from their original text. Hooray, now you understand! So, in conclusion, biblical history teaches us the temporal aspect of the Abraham's and Isaac's odyssey, children of the promise, prefiguration personifying the spared Lamb of God, as symbol of the Messiah (Jesus) coming to save His Church. The outcome of this odyssey began 2000 years before Jesus Christ and will end according to the prophecy during the last Armageddon world war. It will happen in the Lord judge valley of Megiddo, facing the city of Jerusalem, at which time the Antichrist and his army (henchman) will try to exterminate the chosen people. This is when the Lord Jesus Christ will intervene in order to protect His Church. Hallelujah! However, the spiritual aspect of Abraham's odyssey happens simultaneously and we will find out the conclusion upon the glorious return of the Lord Jesus Christ on a thick cloud in order to remove His Church. That is when the next to last battle will happen in order to exterminate the Antichrist as well as the false phophet and all the impious people on the surface of the Earth. As for the devil, he will be destroyed on the white throne judgment day upon the last confrontation between good and evil, namely Jesus and the devil. At last, this is how the tragedy of centuries will end. This confrontation started many billion years ago between God and Lucifer, the instigator of the rebellion in heaven. Consequently, according to the prophecy, after the worst is over, the best is yet to come. Thus, we believers must rejoice and be cheerful because we have hope for a better world where, at last, God's justice will prevail for eternity. Maranatha ! I hope you have enjoyed the Baden-Powell Virtuel Scout Palace, my testimony recounting Abraham's Odyssey as well as that of Church (the elect). I also hope that they have inspired you on such an important topic for humanity as the establishment of God's reign at the time of the parousia. Scout Palace Inc., a non-profit corporation, also offers to all the possibility to contribute financially by buying certificates for the sole purpose of helping the young Canadian scouts and guides to reach greater heights.